This is your second year of Hebrew school on Sunday mornings. Last year, you loved going. Each week, you would talk about what you had learned and would eagerly wait for Israeli Dancing. This year has been no different. You seem to really like your new teacher and classmates. A few weeks ago, when you were getting better and having a tough time breathing, we told you that you could not do Israeli Dancing. The look on your face was priceless. It was like we told you something beyond horrible. In your six year old mind, we had taken away the best part of Hebrew School. Last Sunday, you came home with a lot of items that you had been making with your new Hebrew School teacher. Everyone made items for Shabbat. 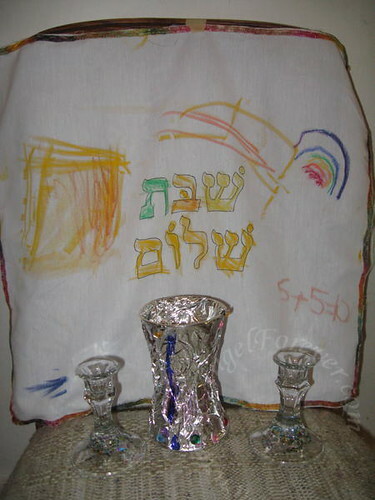 These included decorating candle sticks, making a challah cover and Kiddish cup. In addition to all of these, you have been amazing us with all of the songs you have been learning. Hearing Hebrew come out of your mouth floors me every time I hear it. It is hard to believe that you are almost half way toward being a Bar Mitzvah. Please slow down NHL and enjoy this time. You are growing up way too quickly. This is lovely! I would love to hear your little one speak Hebrew. They do grow very fast. .-= JamericanSpice´s last blog ..BreakPal Lifetime Premium Membership Giveaway! =-.